I volunteered in the dog walking program for over 2 years. I started off at first with one day a week but then went on to 2 days a week. Walking these dogs gave me so much pleasure but I was always worried about them because there were many dogs euthanized during my time there, and in many cases the volunteers were shocked at these euthanizations because they seemed like great dogs to us. Many times during this period I thought about stopping volunteering because I was so upset at these deaths. Two of these deaths particularly upset me. I had got attached to a labradoodle called Gracie. She was very timid and had nipped one of the staff members but had been great with me. Shelley McElvrey, the Animal Welfare Manager, asked me if I wanted to come in and work one-on-one with her - this was the Thursday. I said I would come in on the weekend and do that. I went in on the Sunday morning, to find out that they had euthanized her the day before. Nobody had even thought to inform me. I almost resigned at that point, but thinking of the dogs, decided to keep going. Things came to a head in the middle of October with the euthanization of Titan, a beautiful Dogo Argentino, who everyone had fallen in love with. We knew his time was almost up so all the volunteers decided that they would be willing to pay for his fare to go down the States to a Dogo rescue as we had approached SPCA management to send him down there and they had informed us that they didn't have the funding. A Dogo rescue accepted him but we were told by the SPCA that they weren't on their approved list. 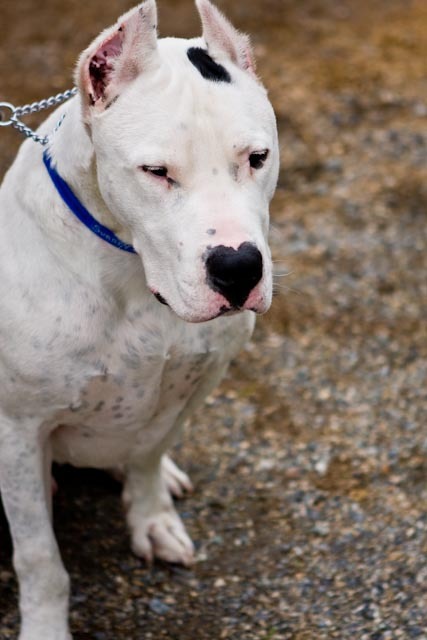 A staff member found a Dogo experienced couple who were interested in adopting him but that never happened either. When the volunteers found out that he was due to be euthanized the next day, we were all crying and head office was contacted and Pat Pryor was sent out to talk to us. (Titan had been on Global on the Tuesday as adoptable and this was 2 days later.) Pat Pryor came out and mentioned that Titan was dog aggressive which none of us had witnessed. The only thing we can think is that he was very vocal when dogs went by his kennel but doesn't mean they are dog aggressive. I decided at that time to resign as I couldn't volunteer for a place that seemed to put such little value on dogs' lives and who care more about covering their own skins. Karen Boan, our coordinator who was fired over this, was one of the most dedicated individuals I have ever met. She went way beyond walking dogs and was forever dropping in with extras for the animals. She was the main reason that the dogs got walked seven days a week because when I started volunteering there they were only walked 3 or 4 days, that is if the volunteers showed up. That in itself is cruelty to animals as many of the dogs are house-trained and try to hold it forever which is very bad for them. If volunteers never showed up the poor dogs are cooped up in their kennel and feces all day. When Titan was killed, many of us sent letters of complaint to management, but to my knowledge none of us even received an acknowledgement. This shows how little they care about the volunteers, even though they rely on them so heavily to get the dogs walked. I think about the poor dogs at that shelter all the time and wonder how many more have been killed. The only one good thing that has come out of this for me is that I'm sleeping a lot better because I'm not up half the night worrying about who'll be next. I have now signed up for the Delta Shelter and feel just such a different atmosphere there. They only euthanize in extreme cases, thank goodness - less than 4%. In fact they have a lovely lab mix Tucker who has been there for over 4 months. They have a trainer working with him to be less aggressive when people approach his cage - he's just lovely outside but doesn't put on a very good first impression. Tucker is very lucky to have ended up in Delta because he would certainly have been euthanized at the Surrey SPCA. I just wanted to share my SPCA experiences with you. Why did the SPCA kill Titan?